Across the first 15 days of August, Paradise Poker will run a $10,000 Push’em Poker competition where players can win cash, electronics goods and even a Grand Series of Poker (GSOP) Live Prague package. Push’em Poker is a new type of cash game table recently launched on Paradise Poker. It’s No Limit Hold’em, but everyone starts with a shortstack of only five big blids. Your only options are to move All-in preflop or Fold. Push’em Poker cash tables are marked with a bracket before their name, and can be found in the lobby at all stake levels up to $1/$2. Simply grind as many hands of Push’em Poker as you can from August 1st – 15th, to be in with a shot at winning a prize. Once you’ve played enough hands, you’ll be entered into one of three freeroll tournaments. After 50 hands, your prize is entry to a $500 Cash Freeroll. Play more, and you’ll find yourself competing for a spot on the Push’em Poker competition leaderboard. Finish high enough, and you gain entry to one of two lucrative freerolls. 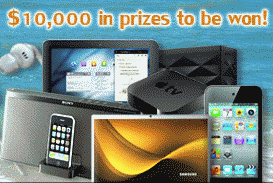 Positions 21 – 100 will move onto the Gadget Freeroll, and compete for prizes including an iPod Touch 32GB, Apple TV, Sony iPod Speaker Dock, Samsung Galaxy Tab 2 (10.1), Jawbone Jambox Wireless Speakers, Philip Noise Canceling Headphones, Ray-Ban Aviator sunglasses, and a Samsung 7 Chronos Laptop. The top 20 leaderboard spots receive $150 cash and enter the Live Event Freeroll. In this prizepool is a Grand Series of Poker (GSOP) Live Prague event package, valued at $3,000 including your buy-in, hotel stay and $500 expenses. When Do The Freerolls Start? All 3 freerolls are set to run on August 19th at 20:00 CET. Players should then email Paradise Poker support to claim their prizes, and can expect delivery within 60 days. Remember, only hands played at Push’em Poker cash tables will count towards the promotion and win you those special freeroll tickets.